This is Year Zero for the Ark and its inhabitants. This is also the setup for Mutant: Year Zero – Roleplaying at the End of Days, a translation of the Swedish RPG published by Free League Publishing, Mutant - År Noll, published in English by Modiphius Entertainment. Mutant - År Noll—or Mutant: Year Zero—is the fifth and latest incarnation of Mutant, the 1984 RPG from which Mutant Chronicles would also spring. Mutant itself was influenced by another RPG, Gamma World, the TSR, Inc. game from which many post-apocalypse set RPGs would derive, and it is Gamma World and Mutant that Mutant: Year Zero harks back to. This shows in a certain wackiness in both the cartoon style artwork that illustrates the book and the mutant powers that the player characters can have. There are major differences though that set Mutant: Year Zero apart from Gamma World. Most obviously, these are the fact that Mutant: Year Zero only offers the Mutant as a player character option, as opposed to the unmutated Human or ‘Pure Strain Human’, Mutant Human, Sentient Animals or Plants, and Androids of Gamma World. The other difference is that although there is a certain Pulp sensibility to Mutant: Year Zero, the RPG is a drier, deadlier, grittier, and just not as wacky or weird as Gamma World. The other major difference between Mutant: Year Zero and Gamma World is that Mutant: Year Zero introduces two elements not found in Gamma World. The first are the rules for technological development—as well as scavenged technology—and the Ark, that enable the Ark to be developed and improved depending upon what technology and artifacts the player characters bring back with them from the Zone. The second is that the game does come with a metaplot that pushes the player characters towards discovering some of the secrets of the game and this is supported by ‘The Path to Eden’, a scenario included in the core book. Like Gamma World, the setup in Mutant: Year Zero means that it can be set almost anywhere, for example, in the players’ own home town, but to fit its metaplot, Mutant: Year Zero demands a certain type of setup in that the Ark should be located on the edge of, or within, a major city, one preferably with waterways, a mass transit system, multi-storey buildings (if not skyscrapers). So ideally, a national capital or capital-sized city. The examples given in Mutant: Year Zero and supported by write-ups and maps inside the front and back covers, are The Big Smoke and The Dead Apple. Of course, the GM is free to set his Mutant: Year Zero wherever he wants and adjust that setting as he likes. A character in Mutant: Year Zero is defined by four attributes—Strength, Agility, Wits, and Empathy, each rated between one and five; a Role—Enforcer, Gearhead, Stalker, Fixer, Dog Handler, Chronicler, Boss, and Slave; skills—a mix of the generic and the specialist defined by his Role; Talents—minor tricks and moves initially defined by his Role; and Mutations, essentially superhuman abilities that are powerful, but unpredictable. Attributes are rated between one and five and can be reduced temporarily by certain effects. For example, Strength is reduced by Damage and recovered by (eating) Grub, whilst Wits are reduced by Confusion and recovered by Sleep. Each Role includes a key attribute and a specialist skill; gives options for a character’s appearance, relationships to the other player characters and to NPCs, and big dreams; and the character’s starting gear. To create a character, a player assigns fourteen points to his character’s attributes, with only the key attribute being allowed to have an initial rating of five. He then selects a Role and chooses from the options roles given. What is really interesting is that as each player selects a different Role, the options for the relationships with the NPCs are different each time, so that one player character might hate an NPC, whilst needing to protect another, and then another player character might need to protect the first NPC, whilst hating another, and so on and so on. What this builds is a relationship network between the player characters and the NPCs in the Ark. Of course, the GM may want to change the names to fit wherever his Ark is located, but as long as he is consistent in the use of the names, this effectively sets up both a relationship network and some motivations for the player characters. Some ten points need to be assigned to the character’s skills. All skills are rated between one and five and a character has ten points to assign to the twelve basic skills and a Specialist skill. No skill can be assigned more than three points and one point must be assigned to the Specialist skill. Compared to the rest of character generation, a player has no choice in what Mutation he receives—it is entirely random. It is possible that a character may start the game with more than one Mutation, but this at the cost of an attribute point. Later in the game, a character can gain more mutations. Hanok (PC) is a bit slow on the uptake. Best explain stuff. In detail. Wiss (PC) is awesome. Keep close. Poll (PC) is out for your gear. Keep it close. You hate… The Fixer Sixter, who tricked you out of an artifact. You need to protect… The Boss Johammed, who pays for your jury-rigs. To build something that will change the People’s life forever. Where Mutant: Year Zero is relatively straightforward in terms of character generation, it begins to get a bit complex in terms of the game rules and mechanics. Mutant: Year Zero uses a mix of cards and dice. Now the cards, consisting of three decks—Artifact, Mutation, and Threat decks—are actually support decks. So when determining a character’s Mutation during character generation, his player draws from the Mutation deck; at the start of a session, the GM draws from the Threat deck to determine a random danger or threat that the player characters might face; and when an artifact is found, a player draws from the Artifact deck. Fortunately, none of the three decks are crucial to play and their content is replicated in the Mutant: Year Zero core rules. The dice are another matter. Mutant: Year Zero uses six-sided dice. Sometimes these rolled as standard six-sided dice, typically whenever a table has to be rolled on, usually a roll of ‘d66’ or ‘d666’. Otherwise, they are divided into three types—the yellow Base dice, the green Skill dice, and the black Gear dice. In addition to the number six all dice are marked with the radiation symbol on that face. This indicates a success when rolled. On the 1 face of the yellow Base dice there is a biohazard symbol, whilst on the 1 face of the black Gear dice, there is an explosion symbol. Rolling either symbol is counted as a failure. The green Skill dice do not have an extra symbol of their 1 faces. Now a game of Mutant: Year Zero can be run without using the specific Mutant: Year Zero dice, but it does at least require pools of the three different coloured dice to represent the Base, Gear, and Skill dice. To undertake an action, a character assembles a dice pool consisting of Base, Gear, and Skill dice. These should be yellow Base dice equal to the attribute used, black Gear dice equal to the Bonus for the item of any Gear used, and green Skill dice equal to his skill. A roll of six on any of the dice rolled counts as a success, but rolling more successes are better as these can be spent on stunts. The types of stunt available are listed skill by skill. So with the Fight skill, you might inflict extra damage, grab an opponent’s weapon, or knock him over, while with Comprehend, you would not only work out how how an artefact works, you could teach others too. If no sixes are rolled, then the action is a failure. The results are even worse if ones or biohazard symbols on the yellow Base dice or explosion symbols on the black Gear dice are rolled. Each biohazard rolled inflicts a point of trauma on the associated attribute, but also generates a Mutant Point that can be used to activate a character’s Mutations. Each explosion rolled causes the gear used to degrade and so reduces the Bonus it provides on future actions, until repaired that is. “Use my shotgun,” Nerack urges. “I can fix your rifle.” Lueb nods and they swap weapons. The gearhead pulls out his tools and gets to work. As a Gearhead, Nerack will use his Jury-Rig skill, which is based on his Wits attribute, and he also has the Tinkerer Talent which grants him a +2 to his rolls. The GM explains that the difficulty of the task is equal to the Gear bonus that hunting rifle would normally grant, which is +2. This sets the Difficulty to Hard or -2. The Tinkerer Talent counters the Difficulty, but Nerack still has to make roll one success. To make it just a little easier, the GM grants Nerack’s player a single Gear die because he has the right tools. So Nerack is rolling five Base dice, two Skill dice, and one Gear die. Rolling the dice, Nerack gets two Biohazard symbols and no Radiation symbols on the Base dice, no Radiation symbols on the Skill dice, and one Radiation symbol on the Gear die. Nerack succeeds. Since he rolled one Radiation symbol, Nerack succeeded and the repair task is done. Yet what if Nerack had rolled no Radiation symbols and thus failed? In this situation, he can the extra effort and Push the roll and reroll in an attempt to get some or more Radiation symbols. He cannot reroll any dice that came up as Biohazard, Explosion, or Radiation symbols, and worse, any Biohazard symbols rolled, including those from the original roll count as Trauma. In addition, each Biohazard symbol rolled generates a Mutant Point that can be spent activate Mutations. Returning to the example, in the first roll, Nerack rolled five Base dice, two Skill dice, and one Gear die, and got two Biohazard symbols on the Base dice and no other results. Having failed, he Pushes the roll. He sets the Base dice with the Biohazard symbols aside and re-rolls the remaining three Base dice, two Skill dice, and one Gear die. This time he rolls one Radiation symbol on the Base dice and one on the Skill dice, but he rolls one Explosion symbol on the Gear die. So he succeeds, but with one Explosion symbol, the GM rules that Nerack’s tools are broken, and with two Biohazard symbols from the Base dice, there is some cost in terms of Trauma. Since Nerack was using a Wits-based skill, this is Confusion Trauma, which the GM rules as Nerack so concentrating on the repair task, that he loses track of the fight around him. On the plus side, Nerack generates a pair of Mutant Points that he can use for his Mutant Ability. Mutations require Mutant Points to be activated. Use of mutations can go awry, for example, it might require more Mutant Points to be activated, the mutation might shut down or it might inflict trauma on a mutant, or the mutant might mutate. This may be purely cosmetic, but it might result in the mutant acquiring a new, random mutation. Combat in Mutant: Year Zero is a quick and nasty. Characters can perform either an action and a maneuvre or two maneuvres each turn. An Action is anything that requires a skill roll or activation of a Mutation, whereas a maneuvre covers anything else that might do—move, dive for cover, draw a weapon, aim a gun, reload a gun, and so on. Trauma, whether from being attacked or intimidated, or when Pushing a roll, comes in four types each of which decreases one of a character’s attributes. So Damage decreases Strength and can inflict critical injuries, Fatigue decreases Agility, Confusion decreases Wits, and Doubt decreases Empathy, which essentially means that Damage and Fatigue covers physical trauma and Confusion and Doubt covers social and mental trauma. When an attribute is reduced to zero, then a character is broken and cannot use skills, perform actions, or activate mutations. A broken character can be killed with a coup de grace. The starting point for a Mutant: Year Zero campaign is the Ark. This is where the player characters grew up. This involves deciding what type of Ark it is, perhaps the wreck of an aeroplane or a skyscraper; where it is in the starting zone and what its layout is; who its Bosses are and what sort of Bosses they are; and the size of its population and its water source. The relationship between the player characters and some of these Bosses will already have been set up during character generation. The players will also decide upon the Ark’s Development Levels. There are four of these—Food Supply, Culture, Technology, and Warfare—which each ranges between zero and thirty-nine. Improving the Development Levels is part of campaign play in Mutant Zero, the players deciding the direction in which the Ark will develop, working on particular projects, such building a pigsty to improve the Food Supply or establishing Suffrage to improve Technology. Bringing back and analysing artefacts from expeditions can also improve Development Levels. Holding an Assembly to decide what Development Level to focus on and then the projects themselves works as a framing device—as well as a source of conflict and roleplaying—between the game’s main emphasis, that of going on expeditions into the Zone. First into sector immediately surrounding the Ark and then the sectors beyond that. The GM is given two sample Zones—The Big Smoke and The Dead Apple—but is also given the means to create his own. Not only determining what artifacts might be found, but also the levels of the ever pervasive Rot—the combined nuclear, biological, and chemical side effects of whatever it was that caused the Apocalypse and which can accumulate in a Mutant’s body; ruins and threats to be found in the Zone; and what events that might be encountered. The threats might include Beast Mutants, Morlocks, Water Traders, Nightmare Flowers, Acid Rain, Inertia Fields, Unexploded Ordnance, and more. Although no actual scenario is included in Mutant: Year Zero, what is given is a quintet of special locations or Zone Sectors. These are complete descriptions of locations around which a scenario or two can be built. These are drawn from the staples of the post-apocalypse genre, so a rival Ark, a cult devoted to a weapon of great destruction built by the Ancients, a gang who make use of modified vehicles, and so on. Rounding out the RPG is a discussion the metaplot at the heart of Mutant: Year Zero and if not its endpoint, then at least the end of a chapter. It includes a complete description of where this will take place and of the secrets that might be revealed when the player characters reach there. The discussion includes suggestions as to how to set the metaplot up. Now a GM and his players do not have to adhere to the metaplot. If they do, there is a definite end point to Mutant: Year Zero, at least until further supplements are published that take the setting beyond this point. Until then, there is plenty of information in the RP to keep a campaign going, much of it revolving around the building and protecting of the community that is the Ark. This is in addition to future support for the RPG as well as any number of supplements for other post-apocalypse RPGs that could easily be scavenged for ideas or adapted. That said, scope for character growth is relatively limited in Mutant: Year Zero and there are really only a few character options available in the core rules. This will probably become apparent once a campaign has lost a few player characters—a likelihood given how deadly the RPG is. That though changes with the release of Mutant: Genlab Alpha, which adds rules for mutant animals, a campaign setting, and rules for adding mutant animals to the default setting of Mutant: Year Zero. Mutant: Year Zero is well presented, it is well written—the GM advice is good in particular—and the artwork nicely captures the scrappy, makeshift, and scoured feeling of the setting. As written, Mutant: Year Zero is not a toolkit to run post-apocalyptic campaigns in general. 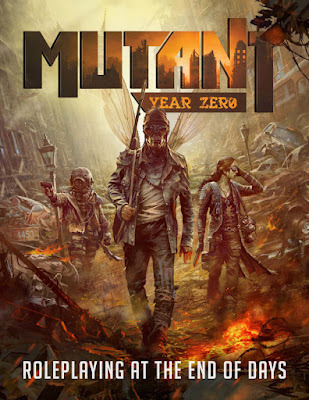 There are elements here though that an experienced GM could extract to other types of post-apocalyptic campaigns, for example a Road Warrior-style campaign, but as written, Mutant: Year Zero is designed with its metaplot in mind. Indeed, there can be no doubt that Mutant: Year Zero is well designed and written to that end. If there is a real downside to the game, it is the need for specialist dice. To be fair the game can be run without those, but it will run easier with them and just using them them with dice of the right colour still requires a bit of effort. Although Mutant: Year Zero – Roleplaying at the End of Days does not do everything that you might want a post-apocalypse to do, what it does do, it does very well. It sets up its metaplot and campaign starting point in an engaging manner and with innumerable roleplaying hooks and drives for the players and their characters. It provides the GM with the tools to build the world around the starting point and tailor it to a location of his choice. It does this in a bright, easy to read, and well presented book. Mutant: Year Zero – Roleplaying at the End of Days is as engaging and as accessible a treatment of the post-apocalypse as you would want to play.